Today, in the early 21st century, only a handful mainframe computer architectures survive. The leader by far is the IBM architecture, produced by IBM, Fujitsu, and Hitachi. The Burroughs and Univac architectures are ranked second and third and are manufactured and supported by Unisys. In Europe Group Bull (now part of Atos) produces GCOS servers along with NEC in Japan. Finally, some very specialized mainframe architectures are still produced for specific markets such as supercomputing in lower quantities. The IBM architecture, which began with the IBM System 360 in the mid 1960’s survives because it eventually had the largest market share, about 80% of the mainframe market. The Univac architecture survived because developed a very efficient transaction processing capability with the UNIVAC 1107 computer and operating system in 1962. 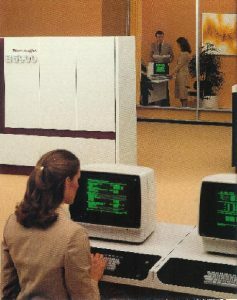 The Burroughs architecture, which had its roots in the B5000 computer introduced in 1960, was not the first mainframe architecture, nor the one with the largest market share, so why did it survive? The reasons are both technical, and political (that is corporate politics). The Burroughs B5900 was critical to the survival of the Burroughs architecture into the 21st century, and that is why its story is important. There is a component of corporate drama that will be told, not that different from other dramas, but people seem to never get enough of that genre. There is also an important engineering story, one that kept the Burroughs mainframe architecture alive into the 21st century. Both stories are interesting, and both will be told, and I hope you enjoy them.